Fun for the whole family and now free for the kids! FREE FOR THE MONTHS OF JULY AND AUGUST. Contact us today and let us help answer any questions you may have, or find that perfect date for your family fishing trip! "The kids were so excited, and here is the best part.......so was Captain Chris...........He loves what he does, and it shows........I was amazed at the attentiveness of Captain Chris to our kids, and making sure that they were well informed as to safety, and fishing techniques, and he made sure that they caught fish!" "It was evident that these folks luv what they do as we entered the complex....we’d not even made it through the entrance when we were greeted warmly by one of the owners. Once at the lodge, we were given a really warm welcome by Sheri, the wonderful lady who does all the cooking...She pridefully recited the menu for the evening, which after hearing, I could hardly wait to unpack the kids and get to dinner. All of her food is made from scratch and native to the area.....I said I would not eat it all and would watch my weight...... OMG, however, when Sheri presented a appetizers of healthy shrimp dip seasoned with herbs and green on onions on crackers, then a crawfish bread appetizer. I cold not help myself. The conversation amongst the other fishermen and women ensued about fishing and we continued on our appetizers. Then, Sheri, totally....totally.... outdid herself on the main buffet, served in the main dining area of the lodge, ; strawberry and spinach salad, broiled trout, fried trout with homemade tartar sauce, wonderful broiled seasoned potatoes, coleslaw, and a shrimp pasta dish that would beat any contest at Jazz fest for Crawfish Monica. It was exquisite! And, I noted, everyone returned for seconds on that one. Dessert was expert as well with homemade pecan pie.....OMG, best of best, and Bannas Foster. Ok, diet or no diet, I could not resist! I had both. Sheri was an expert with kids too. She had just plain Vanilla Ice Cream, which our 7 and 8 year olds luved. Everyone went to bed that nite with full tummies and expectations of the next day. Thank you Ms. Sheri. So far, so really good! Our room was great. Everything was so fresh......The beds were super comfy, pillows good, lots of towels, blankets, etc.. Then, my then little troop, comprised of me, (Mom) and my 7 year old son, Marcel......plus Cameron--- 8 years old, Marcel’s cuz (or cousin ---- my sister’s child) My husband, Mark----who...................by the way was relentless in getting me on this trip......I kept telling him I had to work.......Anyway, I watched as our whole little troop went to bed with full and happy tummies in comfy beds and super clean rooms. 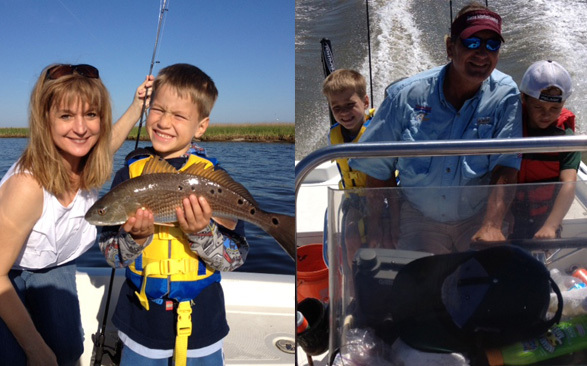 As a native New Orleanean, and a gal who grew up fishing with her Dad in Empire, Lousiana, I found this experience to be one of the best in charters that I have ever had. Now as a Mom, I was able to see this experience in a much different light. The kids were so excited, and here is the best part.......so was Captain Chris...........He loves what he does, and it shows........I was amazed at the attentiveness of Captain Chris to our kids, and making sure that they were well informed as to safety, and fishing techniques, and he made sure that they caught fish! He didn’t stop the whole time. I kept telling him....take a break...life is good.....but he did not stop on making sure that we were going to catch fish........ Well, our kids are great and Captain Chris taught them casting on their own with spinning reals and baiting their own hooks. ...that is if they wanted to...... Captain Chris was always there to bait the hook if they needed it and to help them cast. He was so attentive, that HE even coated them with sunscreen at regular intervals.......Mom didn’t even think of that! 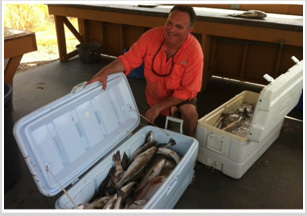 .......We had a most fabulous time with The Staff at Southern Exposure, Captain Chris and staying there!" Tim - Great guide and enjoyed manning the boat with you." All credit cards will incur a 3% convenience fee per transaction.